Lock in a great price for Maya Mountain Lodge – rated 8.7 by recent guests! I fell in love with Maya Mountain Lodge. It was perfect for me. A taste of the jungle with lovely staff who were very warm and hospitable. The food was so fresh and tasty - a real treat!!! Added bonus it was quiet during my stay so I had the pool to myself one afternoon. The food was varied and excellent. Staff were friendly and welcoming. The resort was attractive, well maintained and clean. Loved the fresh drinking water in our rooms. We were right in the jungle and were treated to a colorful display of birds, animals, and plant life from sunrise to sunset. The open air restaurant was a delight. All staff were top notch, but Dee Dee was especially wonderful, warm, and informative. Finally the presentations were great, and the Cacao class was over the top! Beautiful grounds and jungle surroundings, availability of yours, fridges for guest use, all day and evening tea, hot water, and coffee. Pool. San Ignacio is a small town on the jungle side of the country, perfectly located for easy access to multiple Mayan ruin sites. Maya Mountain Lodge will ease your mind by handling all your transfers and tours. The lodge is small, less than 10 bungalows and 6 hotel style rooms. The rates were amazingly low, the staff supremely accomodating, the chefs preparations were great and the tour guides were friendly, fun and informative. Have 'Cisco pick you up from the airport and take you to Xunantunich on the way to the hotel, make sure you eat at his fav restaursant. He grew up there, so he knew everyone and we were treated like friends as a result. We had Elias take us into Guatemala to visit Tikal and his knowledge of the ruins was mind-boggling. The location was beautiful!! Your own private jungle with a hammock. The grounds are so beautiful and quiet. Just far enough away from the city center - walk was short about 15/20 mins. Felt completely safe the whole time. When we didn't feel like walking we took a 5 dollar taxi downtown and getting one back was no problem. Wonderful friendly people at the hotel. They arranged our ATM cave adventure and Tikal. Both a must!! I loved the fact that the restaurant was aware/concerned about any dietary restrictions and food allergies. It made for worry free eating for my husband who has food allergies. We thoroughly enjoyed our stay at the Maya Mountain Lodge. The staff were very friendly, helpful, knowledgeable and fun. Service was exceptional. We had a minor problem with our room and I went to the office to let them know. Before I was back to the room, a staff member was already there to take care of it. In all my years travelling I have never seen such responsiveness. The lodge serves meals (wonderfully delicious), and offers cultural events in the evening (educational and fun). The Lodge provides a variety of tours and handle all arrangements, including drivers and guides. We took several tours and all of the drivers and guides were exceptional. I highly recommend Maya Mountain Lodge. The place is beautiful and you can tell pride of ownership. The owner is present to guide you and really wants you to have the best experience ever, he has hired very knowledgeable staff. Aquaculture project will be amazing! Pool a little cold but doable, it was nice to play with the balls provided. Volleyball net provided too. Medicinal plant tour do not miss! One of our best sellers in San Ignacio! 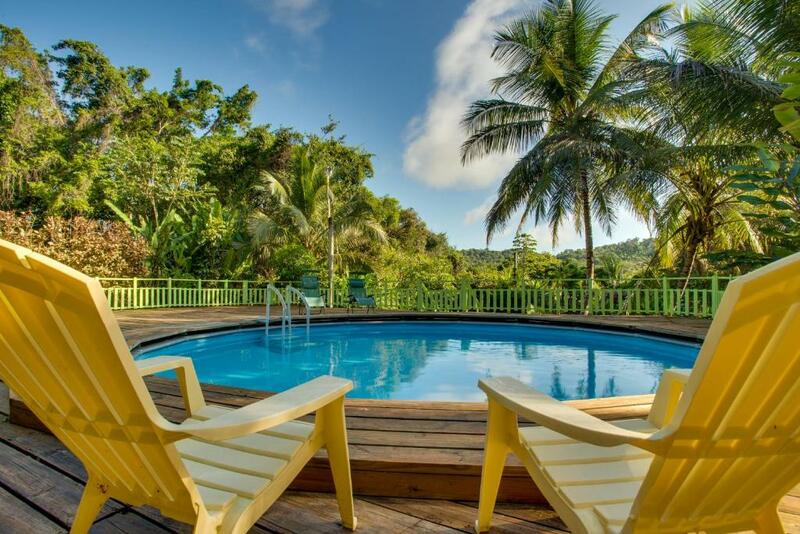 Surrounded by tropical gardens, Maya Mountain Lodge & Tours offers an outdoor pool, a restaurant and bright accommodations with free Wi-Fi and wonderful garden views. San Ignacio town is 1.6 mi away. 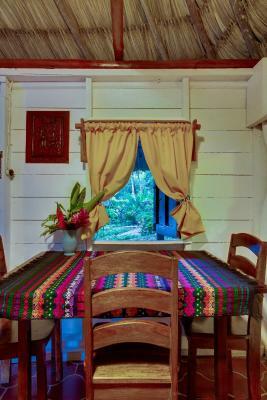 Each air-conditioned room and cottage at the Maya Mountain Lodge features colorful, functional décor and a bathroom with a shower and towels. Some also have a kitchenette and a porch with hammocks. The on-site restaurant serves fresh natural dishes, including vegetables and herbs from the gardens. Several nights a week, you can enjoy themed dinners based on the different ethnic cuisines of Belize. The property organizes activities including kayaking, cookery classes and tours of Mayan ruins such as Xunantunich and Caracol. They can also arrange trips to Actun Tunichil Muknal, known as the Cave of the Crystal Maiden. The area around Maya Mountain Lodge is ideal for hiking and bird watching. The border with Guatemala is within a 20-minute drive, while Belmopan is a 30-minute drive away. When would you like to stay at Maya Mountain Lodge? Overlooking the gardens, this bright air-conditioned room features colorful, functional décor, free Wi-Fi and a bathroom with a shower and towels. 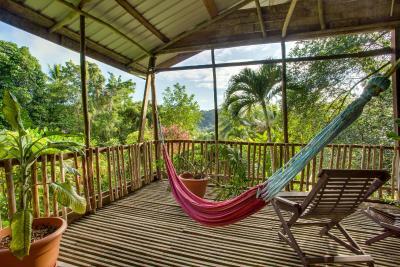 Guests have access to a shared veranda with hammocks. 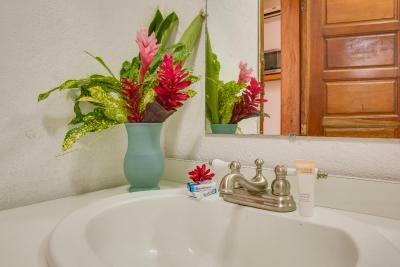 This bright air-conditioned cottage features colorful, functional décor, free Wi-Fi, a well-equipped kitchenette and a bathroom with a shower and towels. It opens onto a private porch with hammocks. Overlooking the gardens, this bright air-conditioned room features colorful, functional décor, free Wi-Fi, a basic kitchenette and a bathroom with a shower and towels. 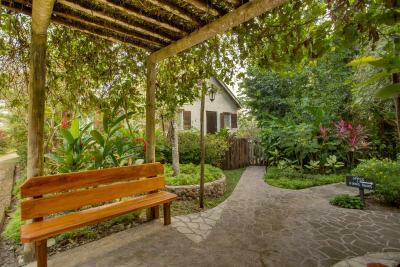 Guests have access to a shared veranda with hammocks. This bright air-conditioned cottage features colorful, functional décor, free Wi-Fi and a bathroom with a shower and towels. It opens onto a private porch with hammocks. This family room features a private entrance, microwave and dining area. House Rules Maya Mountain Lodge takes special requests – add in the next step! Maya Mountain Lodge accepts these cards and reserves the right to temporarily hold an amount prior to arrival. Prices of the activities are very expensive. Eg: ATM caves at the lodge 124 USD per person, in town we paid 90 USD. Also all prices on the menu are in USD, whereas the prices in other places in San Ignacio are in Belizean dollar, however they use the same $ sign, and it only mentions USD at the bottom of the page... this is very confusing, to say the least. Nice lodge with very friendly and helpful people. Possibility the have breakfast early before leaving for an activity in the region, greatly appreciated. Quality of the food is good. I was surprised that a 10% gratuity for every expense was automatically added to our bill. That should be our choice. I was also less than happy with the charge for transportation to and from Belize City. San Ignacio taxis charge about $50.00 per trip, and that is for the ride, NOT per person. We were charged $67.50 per person. I learned that there is an express bus from San Ignacio to Belize City that costs about $9.00 U.S. per person and gets there just as fast as the shuttle. It costs no more than $10.00 U.S. for a taxi from the resort to the bus stop, so compare $135.00 to $28.00. Hmm. 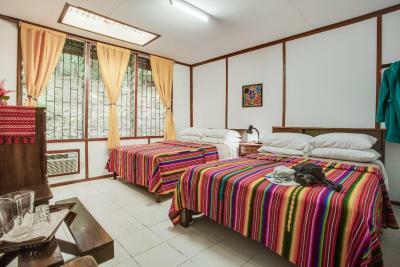 Finally, Maya Mountain Lodge is not in either Santa Elena or San Ignacio, and it is too far to walk to either city, so a taxi is your only option if you want to dine, site-see, or shop in one of the cities. The facilities were definitely basic, the pool is very small. Go for the outdoor beauty and activities. Make sure to ask a lot of questions and follow-up for clarity on specifics. The spa is not like the photos, but the food is delicious. There is a shared fridge for guests to keep other food/snacks/alcohol. The evening entertainment was lack luster. The property is beautiful, very lush and green! The staff is very nice. They could have dealt with the partiers quicker. We had to ask them to tone it down ourselves on the last night of our stay at 1:30 am. This place is really meant for a quiet, relaxing place for couples and families...not a party spot. Staff was very friendly, helpful and showed genuine desire to share the Belizean culture. Food was OK...not great but not bad. Freshly made with many organically grown items in their garden. Very beautiful locale. Cottages were good though the genuine thatched roof had a bit of odor (which you get used to after a few minutes). The lodge was lovely but if I was choosing again I would stay somewhere in town. Not a lot to do other than head out for full day tours and limited to the one restaurant which was ok but we didn’t love. I think it might have been nice to be in town so when you returned from tours you could wander around, explore gift shops, try different restaurants, etc. The only issue one has to watch out for is that the food is priced in USD not BZD and 12.5% VAT & 10% service are added to everything. Our room was quite small but we booked one of the cheapest rooms. If one is staying for a longer it might be worth upgrading. The food here is outstanding and the open restaurant is wonderful. Free tea and coffee are available all day & one has the use of a shared fridge as there was no fridge in the room. The hotel is a couple of miles from Santa Elena and can be walked in 30 mins. The staff here are outstanding. Would have liked more tables and loungers at the pool and on the terrace.